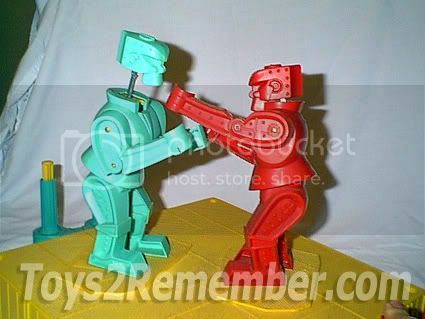 Rock 'Em Sock 'Em Robots Rock! 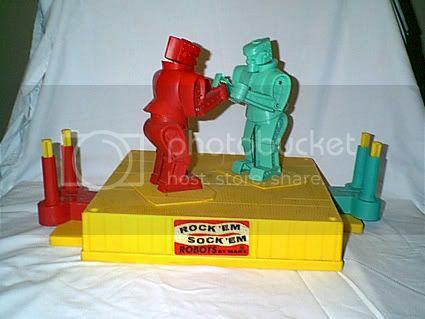 Remember the original Rock 'em Sock 'em Robots? My brother and I had so much fun with Rockem Sockem Robots! I guess we had too much fun because the "ropes" that go around the boxing ring are missing. You can still buy this game, but it is now made cheaply by Mattel. The original was made by Marx and was much better. 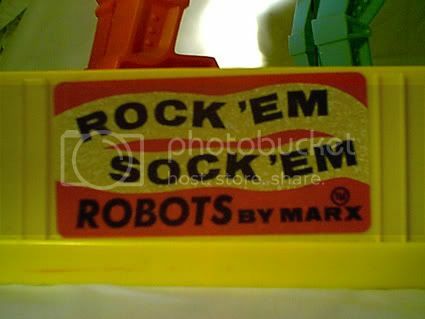 Just as I explained in the previous post, it isn't really Rock 'Em Sock 'Em Robots unless the sign on the front of the ring says "By Marx". Remember Pistol Polo by Marx? Towards the end of its toymaking tenure, the Louis Marx & Company began creating wonderful games with moving parts. 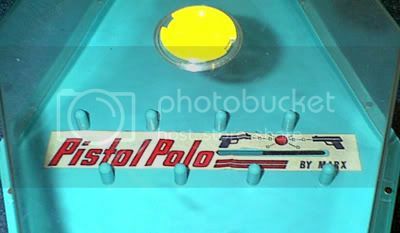 Everyone remembers Rock'em Sock'em Robots, but do you remember Pistol Polo? It was a great shooting game that even moms liked because the BBs didn't get all over the house! It was two guns attached to this clear plastic case the the BB's shot into. 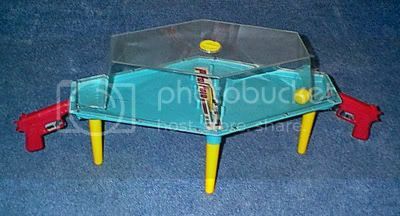 You would fire at a yellow ping pong ball and try to keep it on the other player's side. There was a timer that activated a yellow stop sign to pop up. If the ball was on the other person's side when the stop sign appeared, you won! The concept was exactly like G'nip G'nop. Does anyone remember that game? We had it too, but I don't have any pictures of it. I want to do some research on it. If you know where there is a good write-up or pictures of G'nip G'nop, please let me know. Today's feature however is PistolPolo by Marx! 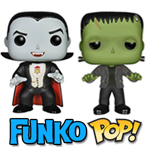 Check out the above pictures and see if you remember!